Kjellander + Sjöberg creates yet an example of contemporary architecture that fits modern needs and without nostalgia corresponds with its site. 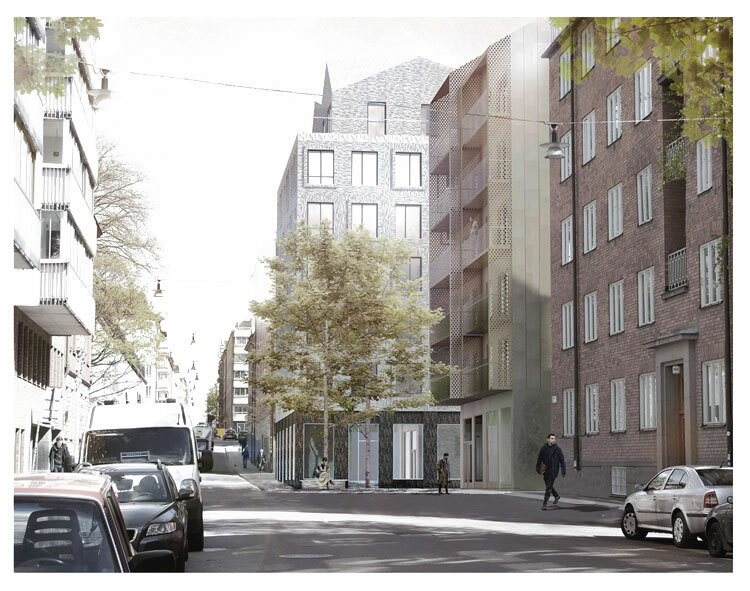 Bönan and Kisen is a new city block on Södermalm that with an urban intensity adds new qualities and preserves the local scale and character. 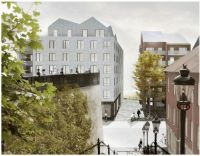 The project aims to add new buildings rooted in the local vernacular, an addition that emphasizes and enriches the urban fabric, providing space for businesses that in turn allow Högbergsgatans urban content to prosper and expand. The design contains two volumes, Bönan and Kisen, (50’s local slang terms for girl and boy, respectively) with distinctly separate identities that are not obviously one development, rather an easy addition opening up towards the park in south. 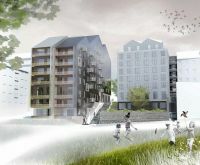 The starting point is the mixed urban context near the lively Medborgarplatsen and Götgatsbacken, which in combination with the view over and access to the park Fatbursparken, is a definite potential for the project’s success. Bönan and Kisen blend into the existing century-old grid structure, with commercial spaces on ground floor and apartments flanking either side of a new path stepping down along the extension of Kvarngatan to the park. 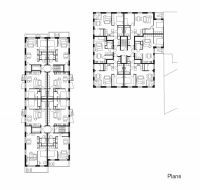 The project originated as a parallel assignment for three practices, after which K + S won the commission. 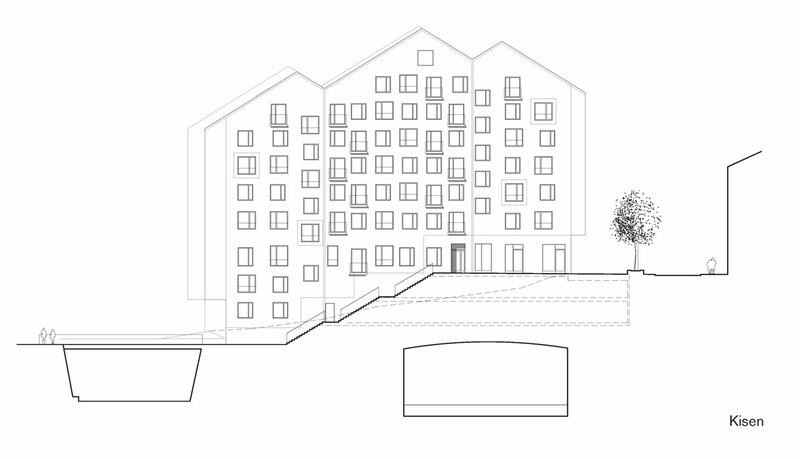 The brief included several considerable challenges: preservation of the open and public character of the site, new buildings must be able to coexist with the adjoining charity and shelter Stadsmissionen and finally new buildings require a rational and financially viable structural solution to cover and build above the three existing underground rail tunnels. Bönan and Kisen is K + S latest project with Einar Mattsson Projekt AB, who develops and builds co-owned apartments and rental property for Einar Mattsson Fastighets AB. Kjellander + Sjöberg (K + S) is one of the leading architectural offices in Scandinavia, based in Stockholm. In close collaboration the four partners Ola Kjellander, Stefan Sjöberg, Mi Inkinen and Lena Viterstedt develop projects and conduct studies in the fields of architecture, urban design, planning and sustainable development. 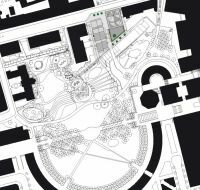 Ongoing projects range from landscape integrated design, public and cultural projects to offices and residential buildings of various scales around Sweden. In the Stockholm development areas the office currently works on Fredriksdal in Hammarby Lake City, Maja Gräddnos in Annedal, Monoliten at Telefonplan and two projects on New Årstafältet with focus on sustainability. 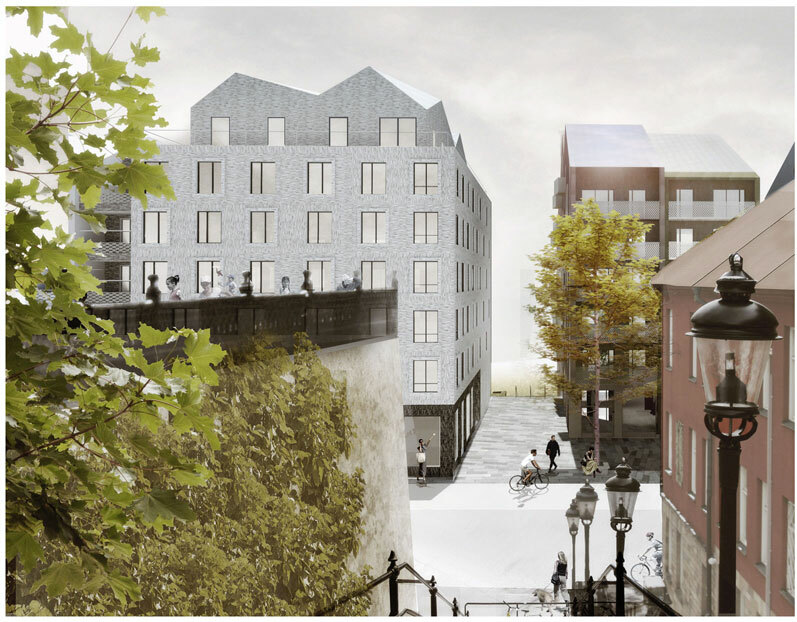 The starting point is the mixed urban context near the lively Medborgarplatsen and Götgatsbacken, which in combination with the view over and access to the park Fatbursparken is a definite potential for the project’s success. Bönan and Kisen blend into the existing century-old grid structure, with commercial space on ground floor and apartments flanking either side of a new path stepping down along the extension of Kvarngatan to the park. 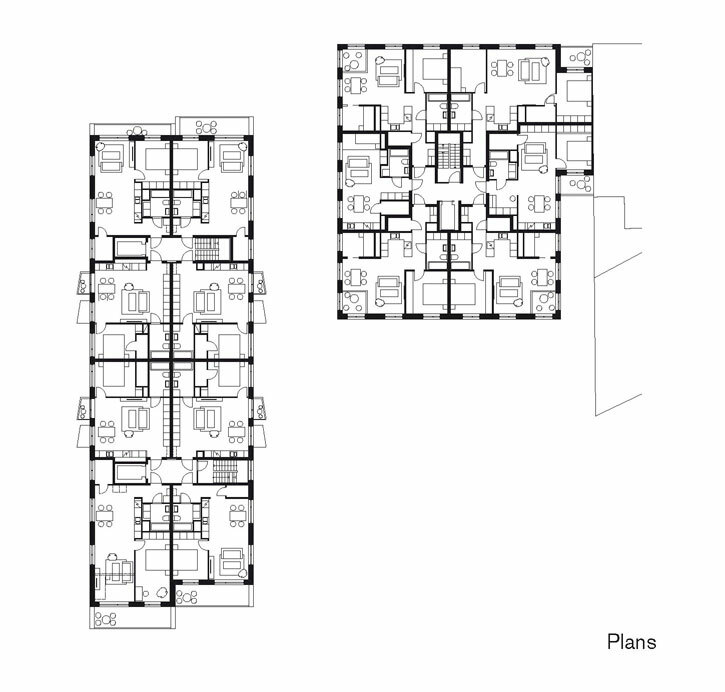 The project originated as a parallel assignment for three practices, after which K + S won the commission. 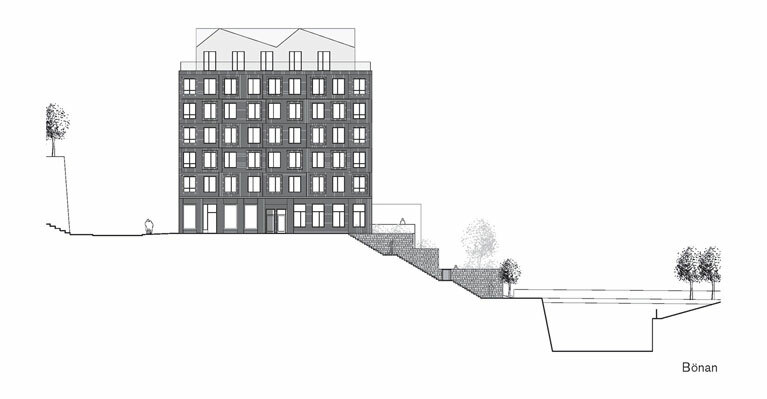 The brief included several considerable challenges: consideration given to preserving the open and public character of the site, any new buildings must be able to coexist with the adjoining charity and shelter Stadsmissionen and finally new buildings require a rational and financially viable structural solution to cover and build above the three existing underground rail tunnels. The realisation of this project necessitates building on what is today J H Romans Park, as a part of the city’s on-going development of nearby parkland around Fatbursparken and Mariagårdstäppan, which will be connected by restored and extended park space on existing rail tracks. Thus parkland is diminished locally but increased in total in the nearby area. A small public space is created in front of the long westerly building – Kisen – an intimate little square planted with trees, facing Högbergsgatan. Kisens volumetric form can be seen as two parallel slabs with staggered roof silhouettes, further accentuated in depth and character through use of material and colour. 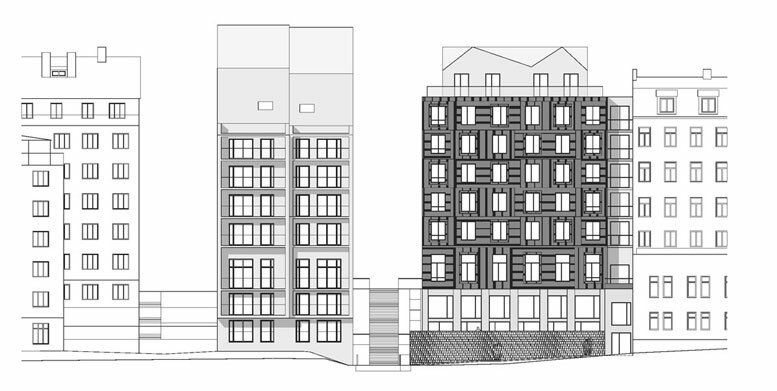 Balconies on the short end of the building are incorporated into the volume, whereas the balconies along the length of the building are external, faced with the metallic material used on the facades. Bönan is a light-coloured, almost cubic brick building with recessed expressive roof volume. The building connects with Stadsmissionen’s adjacent property, but with a visual distance created by a vertical balcony zone in the seam, which allows both buildings to retain the coherence of their volume. Recessed balconies and a clearly demarcated commercial floor at street level perpetuate the structure of the turn- of-the-century city. To the south and facing the park, a protected common garden is created, raised up a level from the lower entrance to Stadsmissionen. 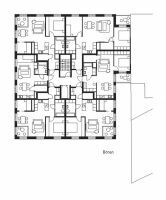 Kisen has smaller, compact apartments aimed at first-time buyers; Bönan has somewhat larger flats with windows in two directions. All apartments are light, with open plans, balconies and a view. 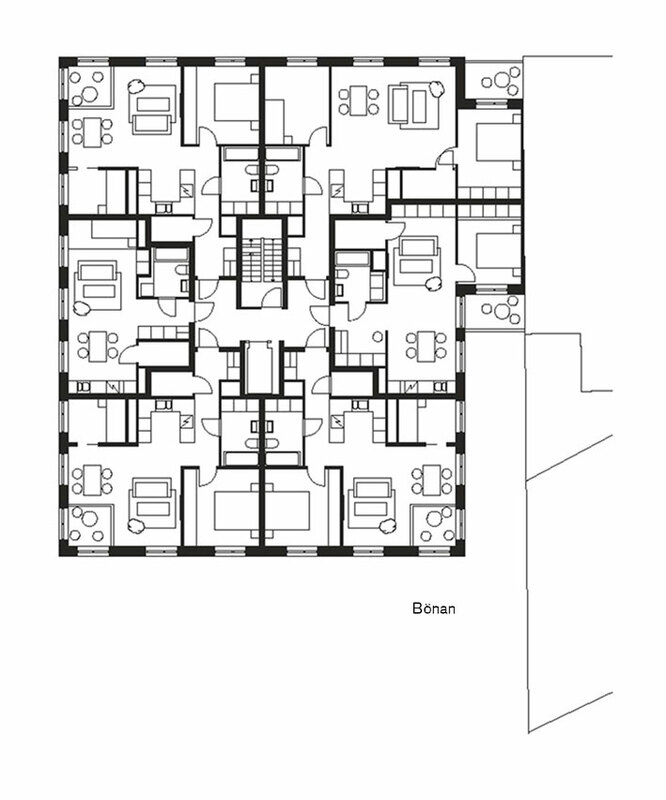 The majority of the apartments have 1-2 bedrooms, with the occasional 3-bedroom flat. Type: Residential Status: In Progress Size: M 1000-10 000 sqm Year: 2010- Location: Högbergsgatan, Stockholm Client: Einar Mattsson Program: 9000 m2, 87 apm Principal: Stefan Sjöberg Team: Ola Kjellander, Fredrik Pettersson, Pontus Nilsson, Axel Freij, Simon Isacsson competition team: Ola Kjellander, Lena Viterstedt, Måns Tham, Mimmi Wide Gustafsson, Kalle Zetterholm.